Polystryrene Beads - Composition Materials Co. POLYSTYRENE BEADS – DEFLASHING MEDIA are useful for many applications including deflashing, lubrication, void space maintainers, grinding media and precision fillers. This product’s unique composition leaves no residue, eliminates expensive part cleaning operations and creates a healthier work environment. Precise sizing prevents lodging in slots and holes, lowering inspection expenses. 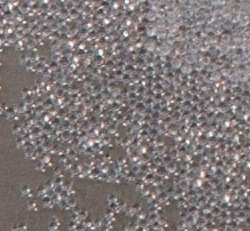 Polystyrene Beads produce excellent results when deflashing sensitive electronic components and delicate rubber parts.